Zermatt, located in the southern part of Switzerland, sits at the base of the Matterhorn, known to generations of Disneyland park patrons. The quiet mountain town of around 5500 permanent residents explodes in the winter as skiers and winter sports enthusiasts converge on the town, attracted by its mountain charm, excellent ski runs, and picturesque setting. Zermatt, named for the German zur matte or in the meadow was a sleeping agricultural town until the mid-1900s. The region's potential for alpine sports was first "discovered" by British climber, Edward Whymper, who led the first successful expedition to the top of the Matterhorn. Zermatt is surrounded by four, distinct ski areas - Sunnegga, Gornegrat, Klein Matterhorn, and Schwarzsee. In addition, there are connecting lifts to the Italian ski areas of Cervinia and Valtourneche. Zermatt offers visitors snow-covered peak, 365-days a year. The resort includes 132 ski runs, 76 percent of which are intermediate, 28 percent advanced, and 28 percent beginners. The facilities include more than 70 railways, chair lifts, and ski lifts, so there's rarely any waiting. In addition to the slopes, Zermatt has 9 kilometers of Nordic ski trails, a natural and an artificial ice-skating rink, and a curling rink. One of the most popular non-downhill attractions is Gravity Park, located on the Matterhorn glacier. This attraction features a half pipe, jumps, and kickers for snowboarders. The resort's indoor facilities include an indoor climbing wall, a large fitness center, tennis courts, and a bowling alley. Zermatt is just as lovely in the summer as it is in the winter. The Matterhorn looms over the mountainside town, in stark contrast to the bright azure sky. Summer attractions include hiking, climbing (both inside and out), and exploring the Swiss countryside. Alpine Museum - located in the heart of Zermatt, this interactive museum houses the rope used in the first successful Matterhorn climb as well as a scale replica of 19th century Zermatt. 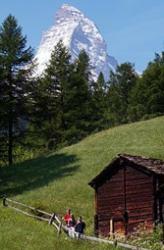 The Matterhorn -- More than just a ski run, the Matterhorn is a symbol of Switzerland. In addition to skiing the dramatic peak, visitors can take a funicular to points near the summit, and, of course, try their luck climbing "the horn" in the summer. The Zermatt Music Festival - The Zermatt Festival, held for three weeks each September allows visitors to meet artists and musicians and hosts a variety of concerts and musical events. The 2006 festival included performances by members of the Berlin Philharmonic Orchestra. 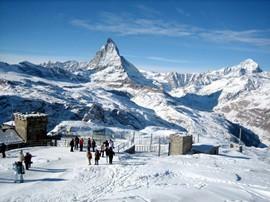 Zermatt is about a three drive from the airports in Geneva, Basel, Zurich, and Milan. The resort town also has its own heliport and is about ½ hour from Milan via helicopter. Alternatively, one can take the train from major cities throughout Europe. The train ride is about four hours from Geneva.Once in Zermatt, getting around is easy. The resort is a car-free zone and offers horse-drawn carriages and electric busses. In addition, visitors can rent bicycles and motorbikes. Of course, most attractions are within an easy walk of your hotel. Zermatt offers all varieties of accommodations - 116 hotels in all - as well as charming bed and breakfast inns and guest houses. The resort town boasts over 100 restaurants, including 38 mountaintop eateries. Zermatt is a family-friendly resort. Children under nine years of age ski free and those up to sixteen ski for half-price.